Niocwy is the original author of this mode, which has been overwhelmingly rewritten, maintained and completed by Vvarderen. This add-on is for those who like having a HUD with vertical and curved bars instead of the default player and target unit frames. CurvyHud also incorporates various functions described in a non-exhausting manner below. If you are in the shop in Crown, and you are teleported in dungeon, the bars will not be displayed correctly anymore. To fix this bug, do a /reloadui. 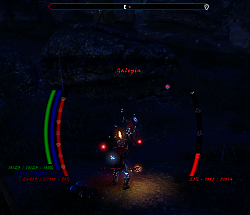 The target healthbar disappeared (this sometimes happens in dungeons and PvP), how to make it come back? This is a known bug since the beginning of the addon which have not unfortunately corrected. To leave with a new bar, remember to assign a key on the keyboard. Move the different elements where you want (left, right, nameplate, interaction prompt, interaction with players, combat aids, etc ...). Modify all bars (position, color, width, height, opacity, anchor, display) and possibility of choosing a style among 3 (default (ex "ehanced") and oblivion (writing) and ghostly). Edit the target information plate (breed, class, level, veteran rank, PVP rank, icon color, text size and font, display critters, etc ...). Edit the text of each attirbut (format, font, size, color, anchor, display), set up warning thresholds. Change the boss icons according to 5 styles (star, sword, Oblivion gate, skull, nothing) and color the guards. Whether or not to introduce a combat notification system (compass that changes color and / or chat). Whether or not to set up a combat support system (Customization - color, text size, font, and displacement). 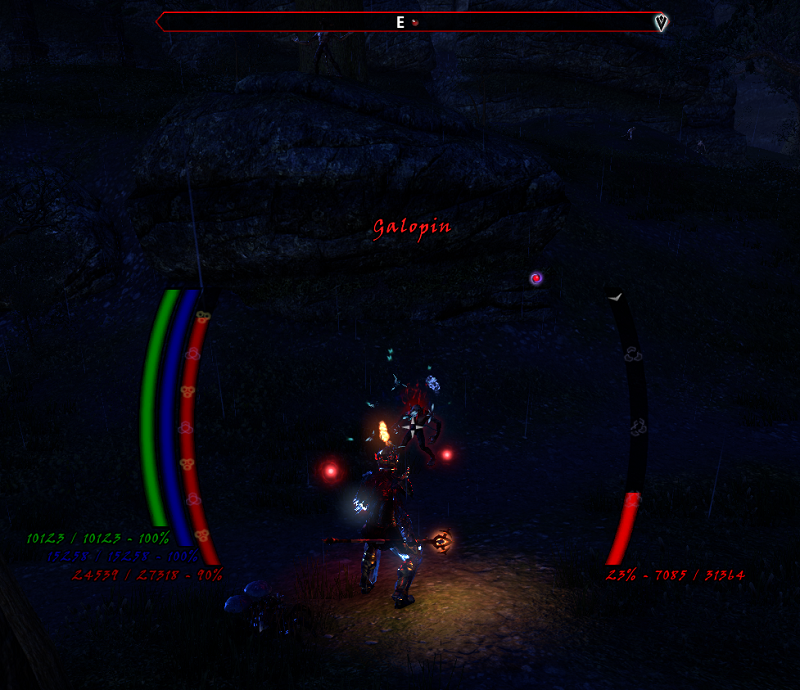 Differentiate the health bar of allied players from your enemies (display and color) as well as neutral NPCs. Show or not a clock and activate or not a timer (beta). You can create a profile (with name of your choice - example : Jean-Pierre). You set it and then save it. Connect your second (or other) character. You can apply "Jean-Pierre" on this character for quickly use your prefered settings. Selecte "Jean-Pierre" in profile list, and cliking on "load". The profiles are not related to a particular character because one can apply (or not) an same profile to several characters. Niocwy est l'auteur d'origine de ce mode, mode qui a été en très grande majorité réécrit, maintenu et complété par Vvarderen. Cet add-on est destiné à ceux qui aiment avoir un HUD avec des barres verticales et courbes au lieu du jeu par défaut ainsi qu'un remaniement des informations de la cible. CurvyHud intégre également des fonctions diverses décrites de manière non éxhaustives ci-dessous. Si vous êtes dans la boutique à Couronne, et que vous êtes téléportés en donjon, les barres ne s'afficherons plus correctement. Pour résoudre ce bug, faites un /reloadui. La barre de vie de ma cible à disparu (cela survient parfois en donjon et en pvp), comment faire pour qu'elle revienne? C'est un bug connu depuis le debut de l'addon qui n'est malheureusement pas encore corrigé. Pour repartir avec une nouvelle barre, pensez à assigner une touche du clavier. Déplacer les différents éléments où bon vous semble (barres de gauche, de droite, plaque d'information de la cible, interaction prompt, interraction avec les joueurs, aides au combat, etc...). Modifier toutes les barres (position, couleur, largeur, hauteur, opacité, ancrage, affichage) et possibilité de choisir un style parmis 3 (par défaut ( ex-amélioré) et oblivion (écriture) et fantômatique). Modifier le texte de chaque attribut (format, police, taille, couleur, ancrage, affichage), mettre en place des seuils d'alerte. Modifier à souhait la plaque d'information de la cible (race, classe, niveau, rang vétéran, rang PVP, couleur des icônes, taille et police du texte, afficher les bestioles, etc...). Changer les icônes des boss selon 5 styles (étoile, épée, portail d'Obivion, tête de mort, rien) et de colorer ceux des gardes. Mettre ou non en place un système de notification de combat (boussole qui change de couleur et/ou chat). Mettre ou non en place un système d'aide au combat (personnalisation - couleur, taille du texte, police de caractères, et déplacement). Différencier la barre de vie des joueurs alliés de vos ennemis (affichage et couleur) ainsi que des PNJ neutres. Afficher ou non une horloge et activer ou non un chrono (en béta). Vous pouvez créer un profil (avec le nom de votre choix - exemple: Jean-Pierre). Vous le configurez, puis enregistrez-le. Connectez votre deuxième (ou autre) personnage. Vous pouvez appliquer "Jean-Pierre" sur ce personnage pour utiliser rapidement vos paramètres préférés. Sélectionnez "Jean-Pierre" dans la liste de profil, et cliquez sur "charger". Les profils ne sont pas liés à un personnage en particulier car on peut appliquer (ou non) un même profil à plusieurs personnages. Niocwy ist der ursprüngliche Autor dieses Modus, der von Vvarderen überwältigend neu geschrieben, gepflegt und vervollständigt wurde. Dieses Add-on ist für diejenigen, die gerne eine HUD mit vertikalen und gebogenen Bars anstelle der Standard-Player und Ziel Einheit Frames. CurvyHud integriert auch verschiedene beschriebenen Funktionen in nicht erschöpfende Weise unten. Wenn du im Laden in Crown bist und du im Dungeon teleportiert wirst, werden die Balken nicht mehr richtig angezeigt. Um diesen Fehler zu beheben, führen Sie ein /reloadui aus. Die Bar des Lebens meines Ziels verschwand (Das passiert manchmal in Dungeons und PvP), wie man es wiederkommen lässt? Dies ist ein bekannter Fehler seit dem Beginn des Addons, die leider nicht korrigiert wurden. Um mit einer neuen Bar zu gehen, Denken Sie daran, einen Schlüssel auf der Tastatur zuzuweisen. Bewegen Sie die verschiedene Elemente wo immer Sie wollen (linke Leiste, rechts, Typenschild , schnelle Interaktion interraction mit den Spielern, die Bekämpfung von Aids, etc ...). Ändern Sie alle Stäbe (Position, Farbe, Breite, Höhe, Deckkraft, Anker, Display) und die Möglichkeit, einen Stil unter 3 zu wählen (klassisch (ex-verbessert) und Vergessen (Schreiben) und Gespenstisch). Ändern Sie den Text jedes attirbut (Format, Schriftart, Größe, Farbe, Anker, Anzeige), eingerichtete Alarmschwellen. Bearbeiten Sie die Zielplattform Information (Rasse, Klasse, Stufe, Veteran Rang, PVP Rang, Symbolfarbe , Schriftgröße und Schriftart, zeigen die Lebewesen, etc.). Ändern Sie den Boss-Symbole selon 5 Arten und färben die Wachen (Stern, Schwert, Oblivionstor, Schädel, nichts). Unabhängig davon, ob ein Kampf Benachrichtigungssystem einführen Kompass, der Farbe und / oder Chat ändert). Unabhängig davon, ob ein Kampfunterstützungssystem zu etablieren (Customization - Farbe, Schriftgröße, Schriftart und Bewegung). Unterscheiden Sie die Lebensstange der Alliierten von Ihren Feinden (Anzeige und Farbe) sowie neutrale NPCs. Zeige oder nicht eine Uhr und aktiviere oder nicht einen Timer (Beta). Sie können ein Profil erstellen (mit Namen Ihrer Wahl - Beispiel: Jean-Pierre). Sie setzen es und speichern es dann. Verbinde dein zweites (oder anderes) Zeichen. Sie können "Jean-Pierre" auf diesen Charakter anwenden, um schnell Ihre bevorzugten Einstellungen zu verwenden. Selecte "Jean-Pierre" in der Profilliste und auf "Laden"
Die Profile beziehen sich nicht auf ein bestimmtes Zeichen, weil man ein bestimmtes Profil auf mehrere Zeichen anwenden kann (oder nicht). - Fixed error to show walls and doors's bars in PVP and fixed error to update HP. - Added new choices in General Settings : show or not the decimal separator of current/max values and one digit after the decimal point in the percent values. - Added fix in EVENT_PLAYER_DEAD. - Fixed error in translate files. - Behavior of the chrono in auto mode and sp modified for greater automation. - Reduced chat flood information. - Reduced maximum of number local variable for minimize of the RAM occupation. - Reduced many comments and blank lines for the computer reading optimized speed. - Continuing debugging action of last version. - Creating a unique reticle for CurvyHUD. Add texture files, and moddification in depth of the code for integrated warning indicator to give the states in color "in combat", "disguised" and "hidden" and finally to color the new reticle according to the reaction of the target, or not. There is the possibility to keep the basic reticle and adapted the target reaction colors, or not. Many LUA files modified. - For fun, change the naughty sentence written by the addon at the death of the player by randomly chosen sentences depending on the place (dungeon or not). - Modification of the EVENTS disguised and hidden, noticeably the behavior of the sentences inscribed in the chat. - Integration of an indicator in the chat to give the difficulty of the dungeon in which you enter. 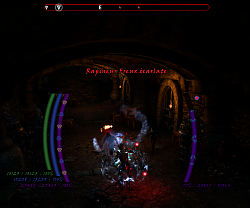 - Added a dead counter, which resets each time the addon loads, teleports you, enters a dungeon, or activates manually by entering the "curvy_raz" command in the chat. - In the menu, choice to show critters and deads, are now separated. - When you are in combat state, critters and deads are not showing. They are will be only shows when you will be out of combat if you have selected show them. - The caption or player's title, is now above the target name and the level below the target name to improve readability. - The spacing between the elements composing the TargetName has been reworked for a better appearance. The size is now adjustable between 15 and 55. - Fixed a bug that occurred when you entered move mode with slah commands that caused the displayed TargetNamePlate to be wrong. - Reinforcement of the code to tend towards a disappearance of the bug which makes disappear the bar of life of the target. - Important menu changes. Changing the old menus for the compass, combat aid, fable attributes and options related to the various elements scatter. Added menu "Clock and Chrono" and "Compass, reticle and alert". Important update of language files. - Adding a new feature: the clock! You will like all elements of CurvyHud, customize this item via the menu! Format 24h00. It will not be planned to develop another format for displaying the time. - Implementation of a chrono (in clock frame) which, by the assignment of a key, can be started, paused and stopped. You can choice to select the manual mode or auto mode in slash command on the chat. The Chorno is in BETA mode state. - Now, if you are not in combat, the guards will no longer have their names in red (hostile) when they go into attack mode on another player. - Added a new file named "Patch.lua", it makes it possible to correct the impossibility of making work in combat the event "EVENT_MOUNTED_STATE_CHANGED" which generated the non disappearance of the bar of mounture whereas the avatar is no longer on a mount. - Fixed shield's bug on targetbar when target is an new targeted. - Fixed degen and regen's bug. - Text Correction in the menu. - Big work of rationalization of the whole code. - The animation of the target life bar will be almost instantaneous when you change the target and animate as usual for the target in focus. - Corrections of several bugs in the move mode. - Reinstatement of choices of choose to display or not the titles and levels of the players, following my action of reduction of the menus in the previous version. From now on, when the titles are no longer present (either the target does not have one or the option is deactivated), the race icon takes the place of the title. Just as when the player level display option is disabled, the class icon is positioned instead of the level. - The nameplate frame has been expanded. - Added and redisigned information in welcome chat information. Update of localization files. - Fixed a bug where the taunt icon did not disappear properly. - Choice color of difficulty (The names will always be colored according to the reaction of the target and the level of the targeted player will always be yellow. - Add information chat when you disguise state changed, rewiting chat combat state. - Add disguise color state on compass : green when disguised in an active zone, orange when you are spotted or the fight is engaged but you keep the disguise and red in combat without being disguised. - Modifications of the effects update in Updates.lua codings so that the selection / deselection of the options in the menu is effective. Also changes the life bars when you go into move mode. - New significant modification of the menu. Appear visual effects sub-menu where you can choose and see the different effects displayed on the bars, as well as color them. - Rationalization of effect colors. - Repositioning some elements of the default bar style. Complete overhaul of the "Oblivion" bar style. - Reintroduction of ghost bars and reworking textures. - Update licence, Update and completeness Acknowledgment section. - Series of tests of operation of the bars during nearly 10h. The problem of disappearing from the target's life bar is still present, but lessen thanks to the hotkey key to reload the bars. I did not have any major bug. - Fixed bug with Libs and update LibAddonMenu 2.0r24 to 2.0r25. - New Warden icon class. - Fixed a bug that caused an error when using the German language. - Added part of GGFrames fixed addon by Agade to refresh all bars with choice. You can assign a key on the keyboard to force the refresh in the event of a malfunction of the target bar. - Grouping of the different targeting functions into the Main/Events.lua file into a single unique function (EVENT_RETICLE_TARGET_CHANGED, EVENT_BOSSES_CHANGED, EVENT_TARGET_CHANGED) nammed "OnReticleTarget". - Simplification of "UpdateTargetInfo" function into the Main/Controls.lua file. - Integration of "BuildBagSlot" function of Harven's Bag Space. - Changing the "OnPowerUpdated" function in Main/Events.lua file. - Changing the "InitTargetBar" function in Main/Initialize.lua file. - Fixed a bug that caused a LAM error when CurvyHud was played alone. - Adding choice in nameplate to see either the account name or the character name (default) or both. - Suppression of history default bar of Niocwy (dds files, textures config and her choice in menu). - Global reorganization of the addon. - Removed options to show or not the default ZO bar (player and target). 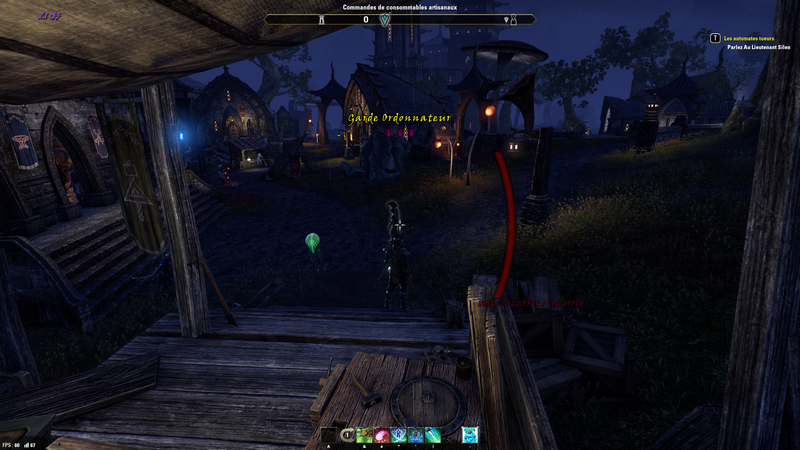 Now, it is whether or not to display the specific CurvyHud attribute bars that will make the Zenimax base bars appear or not. The same applies to the name of the target. - Completeness of the "CurvyHud:ShowHud" function in Main/Visibility.lua file. - V.4 of CurvyHud savedvars. - Fixed bug that prevented the increase or decrease in the physical resistance of players and NPCs during retargeting. - Disappears in the menu the high and low value of the color of the borders of the bars. Instead, an dropdown option to display it (in white color) or not (invisible). - Adding function to show or not the increased and decreased magic resistances (as like armor increase or decrease). Therefore, integration of the EVENT "EVENT_EFFECT_CHANGED", related functions as well as textures. - Adding all or part of the Srendarr database, adding code to see the increase and / or reduction of the magical resistance of the target and the player. - Major retouching of the textures files of the bars with also the addition of the textures of the increased and reduced magic resistance effects. - Modification of the code to add to this new function the increase and / or decrease of the physical resistance. - Added choice in menu to enable or not major/minor increase or decrease effects on bars (spell resist and physical resist). - Added function to show your target taunted. Adding taunt textures. - Fixed a bug when you were in motion mode that still displayed the default target frame bar when it was to be hidden. - Removed Ghostly bar (I did not have time to rework it). - Retouching on the Oblivion bar et new "default" (ex ehanced) bar. - Rewiting function of low attribute alert. - Fixed bug that caused the target's shield value to still be displayed even if the target bar was not. - Fixed bug which made values not anchor themselves to the containers when they owed it. - Added new function : You can now change the opacity of the Allied player bar on two aspects: either when they are in combat or when they are out of combat. - Colors of target bars : if target is a neutral NPC (and not in combat of course), text and/or bar are same color than her name color (Yellow). When neutral target are entering in combat, all colors passed red. Elits Monsters (Boss and guards) are red too. Other Players are allways blue by default. - The result in the menu choices of the compass is changed: you can now display the compass, the boss bar and the texture. - Modification of certain lines (visibility.lua in particular) which generated minor errors in the behavior of the compass and inaction of certain menu parameters. - Rewriting and simplifying choices in compass options in the addon menu. - Fixed bug with move container bar.text when choice is color of bar. - Reduced calls of the functions initPlayerBar and InitTargetBar for more optimized information and more less flood. - Fixed bug to the player's life bar to be correctly displayed in the move mode instead of the target or 1000HP. - Fixed bug to correctly displayed the player's level in the move mode. - Rewiting Acknoledgement Menu, and integration of new submenu for reduice visuals/event. - Add new SubMenu for creat a new profil to gain space and visibility. - Merge the Armor Status submenu and the Active Effects submenu into a new submenu. - Suppression of the modification of the text format of the value of the shield, because not significant and without interest. - Modifying the tooltip of the text format the value of the attributes for better understanding. - Modifications of Loc files and complete revision. - Completeness of the fusion of the functions of animations of the bars and the shields into one function. - Adding a new feature: You can now assign a color to the life bar of allied players to differentiate them from your enemies in combat. You can also activate this feature or not. - Heavy update loc files. - Fixed the bug that caused container texts to disappear when you made changes in the menu settings while displaying the move mode. - Rewriting, removal, adding, shifting of several lines and fixed minors bugs. - Removal of geolocalisation, try to show target name in combat, Result action and information of modification on chat. These functions were in no way useful, and ultimately was more intrusive than real help in anything. - Combat in chat modified, removal code to try display the name of target in chat. The text color of the attribute bars is now adjustable on two options via a dropdown ("default" in white or the color of the corresponding attribute). Deleted the many SubMenu of bars and rewriting a single submenu, with a dropdown to select the bar of your choice as before in lasted version of Niocwy. Rewiting code and added dropdown in ArmorInc or ArmorDec submenu, with a dropdown to select the Unit of your choixe (player or target). Deleted on of two submenu of Visuals (shields settings), and rewriting a signle submenu, with a dropdown to select the Unit of your choixe (player or target). Modified submenus of end of Menu to tow news subemu : submenu COMPASS TEXTURES, RETICLE AND LOW ATTRIBUTES and submenu of COMBAT ON CHAT AND COMPASS AND COMBAT TIPS. Big modifcation of submenu of TARGET NAMEPLATE. Deleted many choice of icons colors. New Drowpdown choice to centralize the color change of the icons. You can colorize all icons of nameplate in white or gold, or silver or color of player's alliance targeted. Modified position of Guards icons settings. - The color of low attributes is automatically the same as that of the corresponding attribute. - The color of critters is automatically the same as that other NPC reaction and option in menu are deleted (except the choice of displaying them or not). - Update LibAddonMenu (LAM) 2.0r23 to 2.0r24. - Deleted choice to modify the color of compass. - Modified settings of targetNameplate, and table associed in controls.lua file. - In event (boss, black anchor,etc...), the dead targets have their names in gray color, and their bars of life masked. - Correct bug action with hide Alert&Notification. - Added rewrited Interraction Prompt, adjust poistion texts and buttons. - Added full german localization. - Added function show/hide text when you are hidden/discovered in Stealth mode on reticle in "Compass, Boss and Combat Status" options. - Debugging Color compass in combat when smallUi and rename "hight wisibility". - Decrease armor on Ehanced and Oblivion bars slightly modified. - Rewriting a part of code in event.lua, visibility.lua, menu.lua, loc_XX.lua, CurvyHud.lua, visuals/events.lua. - Added Player to player interrection prompt on new container movable. - Added choice for combat state in the chat and ehanced code (L.default(...) with just state In/Out - L.target(...) try to display name of target - L.none(...) don't show). - Rationalization of the size of icons (race, veteran and class)	. - You can henceforth choice color of Zone and SubZone Text in Center Screen among ten pastel colors (white in default). - Logo Ehanced on addon. - Geoposition ehanced on chat and Menu choice for diplay in chat and/or on Center Screen Annoucement, Loc files updated. - Add Alert Text notification menu choice for display. - Debugging MigackaBar Text value. - Return to Font 'Univers 67' by default, 22 for text value attribute and 26 for TargetNamePlate, and barWidth default 60. - Rewrited code for Center Screen Annoucement, Hide/show Alert&Notification. - Correct german by Raghor - Zones and SubZones is still missing. - Bugs with English name of race (again... sorry). Ehanced logo! on webSite, in v3.0d for addon in game. - Morrowind update, icon of warden added, armor_Inc and armor_Dec separated, test with enhanced bar. - Ghostly style bars added, Oblivion style bars added, Loc_En and Loc_De updated. - bug correction of button and savedvars (migration), Intensive testing save user config. - On chat add information when an parameter are changed on menu, profil loaded, charged, saved, and created. - Licence added, choice of display veteran icon of NPC and/or other players added. - News icons of Alliances (3), Races (10), Veteran (1) and class (4) added. - News Slash command added and colors. Debug armor Inc et Dec (on Visuals\Visuals.lua and Controls.lua) and choice RGBA added in saved vars and menu. Error404 added. - Attempts to add anchor elements, but to no avail. - Texture's test (name : ehanced aka ehan) file added and menu to selected style of bars. Intensive Global Testing. - Menu interagly writed for Controls LAM 2.0 v.6 (originally by Niocwy). - Select compass red in combat and hide bossBar added. Warden class added. - Cleaning and markup lines in files, color choice and Loc.DE added. - debug and delete lines on errors. - update first files by Vvarderen. last version of Niocwy - thanks to him! Update version : 6.3 available. Detail in change log tab. Super Merci beaucoup ça marche !!!! la barre est de nouveaux visible. edit après avoir testé : il reste un petit problème quand on répare ou détruit un mur la barre n'est pas rafraichit, la valeur ne bouge pas, il faut bouger le curseur sur une autre cible et revenir sur le mur ou la porte pour avoir la nouvelle valeur. La barre jaune ne s'affiche pas, on ne connait pas l’état de la porte pour les réparations. j'ai testé en supprimant tous les autres addons, reset des réglages, en 5.11 pas de problème. Cela devrai corriger ton soucis en attendant la prochaine version. Last edited by Aprilm : 01/13/19 at 12:08 PM. Last edited by Aprilm : 01/02/19 at 11:25 AM. Do you have plans to create an option to remove gradienting on the bars? I like my bars solid but it seems cant find a way to make it less "pop-outty"
Okay, I will create a new one called "flat". 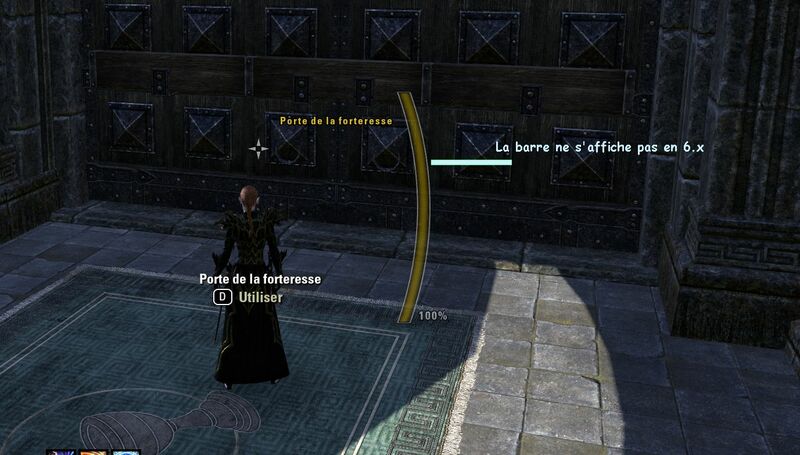 Depuis quelques jours en PVP (cyrodiil) le niveau des murs et portes des forts ne s'affiche plus (6.0 à 6.2). je suis repassé en 5.11 et la tout fonctionne. 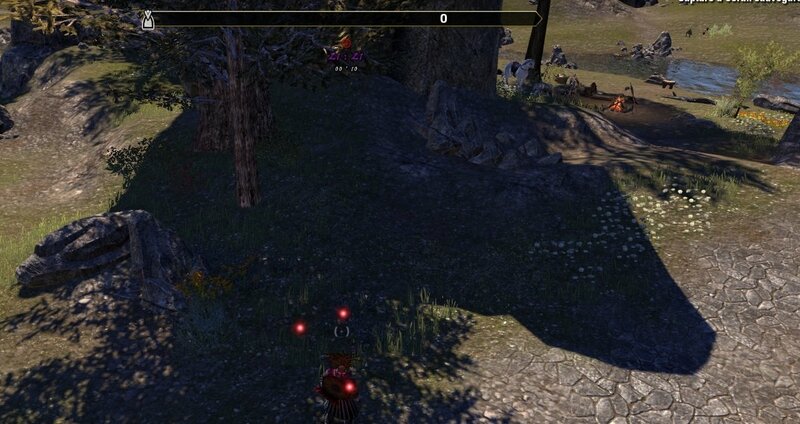 Since a few days in PVP (cyrodiil) the level of the walls and doors of the forts is no longer displayed (6.0 à 6.2). I went back to 5.11 and it all works. Comme je ne vais pas en pvp, je n'ai pas de compréhension sur l'absence de ce type d'information. Peux-tu m'en dire plus? Last edited by Aprilm : 12/29/18 at 08:18 PM. Last edited by Techbro13 : 11/24/18 at 10:10 PM. Update version : 6.2 available. Update version : 6.2 available. Detail in change log tab. Update version : 6.1 available. Update version : 6.1 available. Detail in change log tab. Last edited by vvarderen : 11/11/18 at 02:13 AM. G'day. Thanks for the new updates! I really like the custom reticle. It is very cool, and looks awesome. The new reticle does not change when I move in or out of range of a target. The original one shrinks. Could you implement that? [19:12] CurvyHud :  Your deadometer has been reset. [19:12] CurvyHud : Chrono in manual mode. For translations, do you use any service or tool, or only the Loc\FR.lua, Loc\EN.lua, files? I can help with some English translations, and want to make them very easy to use for you. Last edited by SlippyCheeze : 11/10/18 at 06:34 PM. New version : 6.0 available. Detail in change log tab. I am always on the development of the future version of CurvyHud. I work to reduce the recurring bugs of the previous versions, as well as a new optimization. 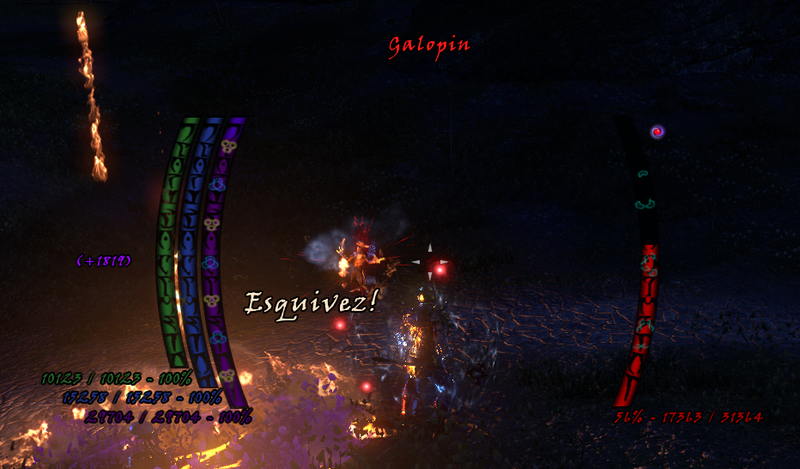 Will be integrated in the version porchaine a small overhaul of TargetNameplate to gain consistency. A new function will see the day soon: the choice (or not) to choose a new ... reticle! It gives me for the moment satisfaction, it remains for me to settle some minor minor details. I will also change some rules in combat to gain visibility, especially for the players who activated the critters and the dead. Nevertheless, if you have suggestions to communicate to me in the framework expressed above, I am listening to you. Update version : 5.11 available. Detail in change log tab. No Donation! Just your help to make this addon better. Pas de dons! Juste votre aide pour rendre cet addon meilleur. Keine Geschenke! Nur Ihre Hilfe dies die beste Addon zu machen.